Are you constantly adding more soy sauce to your noodles and complaining about tasteless dishes in restaurants? Are you always craving for chips and always the first to grab the salt at the table? Chances are you’re consuming too much salt and should lower your salt intake. 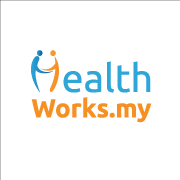 A recent study has found that Malaysians consume almost twice the maximum amount of salt recommended by the World Health Organisation. This salt addiction could lead to problems like high blood pressure, kidney diseases, and heart failure. Consistent evidence also suggests that high salt intake over the long term causes thickening of the muscles on the left side of the heart (known as left ventricular hypertrophy). This poses a strong risk factor for heart disease that is independent of blood pressure effects. Everyone can quickly up their health level by cutting down on their salt intake. The highly publicised findings of the DASH (Dietary Approaches to Stop Hypertension) Diet Study shows strong evidence that links dietary salt intakes to blood pressure. Sodium is the key nutrient your body uses to control your blood pressure and blood volume. So you know it’s important. However, the maximum recommended daily intake is 2,400mg (that’s one teaspoon of salt, any more and you’ll over the limit). 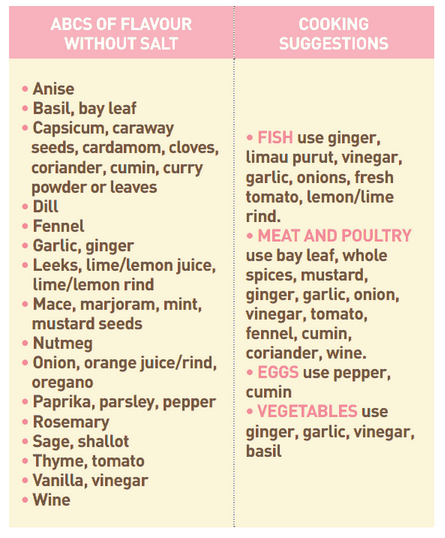 Aside from table salt, there are also many other types of salt to choose from – iodised salt, rock salt, sea salt, vegetable salt, garlic salt, celery salt, organic salt, etc. It is important to remember that no matter how fancy the salt sounds, it still contains mainly sodium chloride. So when your favourite health store is pushing a “healthy” salt onto you, remember that there is really no recommended ‘right type’ of salt. A salt by any other name is still salt. It doesn’t take a giant effort to reduce salt in your diet. Yet its benefits are numerous. 1. Do not add salt to your food at the table. 3. Cut down on flavouring agents (such as stock cubes, packet seasonings, belacan). 4. Eat home-cooked meals. When cooking, minimise the use of salt, this allows more control of sodium in your diet. 5. Read product labels. 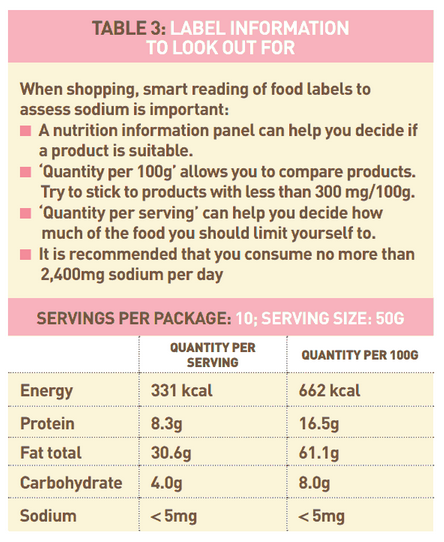 Choose products labelled: ‘Low salt’, ‘Reduced salt’, and ‘No added salt’. Also identify sodium / salt / MSG / sodium bicarbonate content of foods. 6. Use natural flavouring enhancers such as spices and herbs instead of soya sauce, oyster sauce, fish sauce, tamarind, tomato or chilli sauce. 7. Substitute salt-reduced or salt-free versions of biscuits, confectionery, bakery items and margarine or butter. 8. Make home-made versions of chilli sauce with fresh chillies and vinegar. 9. 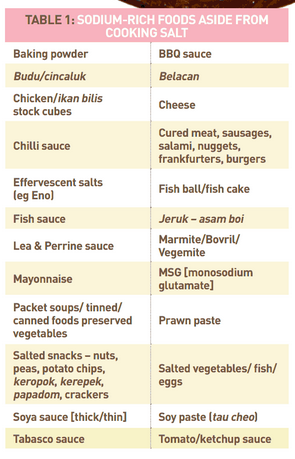 Don’t keep tomato ketchup or chilli sauce, or soya sauce bottles at the table. 10. Avoid sambals, pickles, papadum/appalam, chutneys in meals. 11. Avoid eating fruit with asam boi powder. 12. Avoid canned foods in brine like sardines or peas. 13. Avoid eating outside meals or bringing home food bought outside. These usually contain monosodium glutamate (MSG), which is 70% sodium. 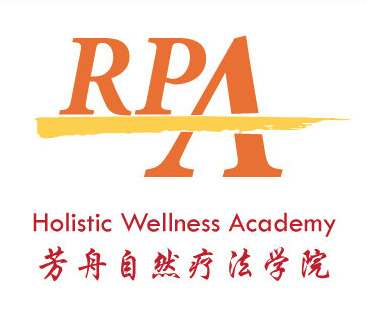 Many restaurants and hawkers use MSG to make their food taste better, while disregarding your health. 15. 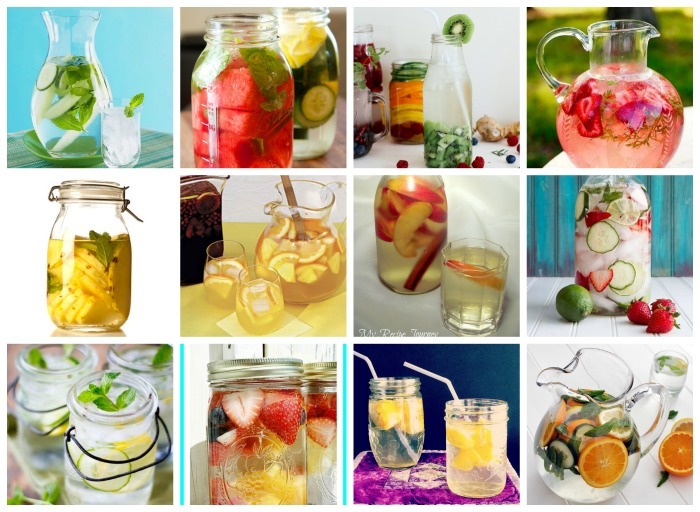 Increase intake of fruits and veggies. This increases your potassium intake which lowers sodium retention. Bananas are a great way to start! You don’t need salt to make things tasty, you just need to be creative with your ingredients! What’s your guilty pleasure when it comes to salty food? How do you make it less of a guilty pleasure? 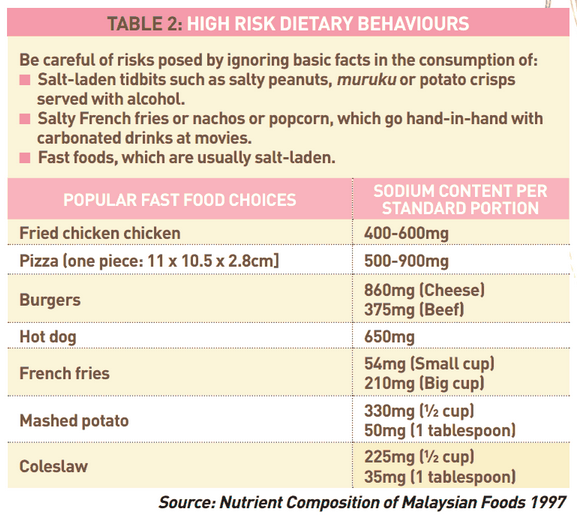 Adapted from: “Hidden Dangers of Salt” by Associate Professor Tilakavati Karupaiah, PhD., APD, AN Head, Dietetics Programme, School of Healthcare Sciences, Faculty of Health Sciences, UKM.